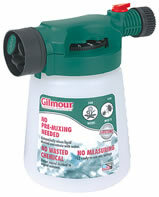 SPRAYER DESCRIPTION: 1 Quart Dial A Mix. This sprayer is much like the previous one but with a few enhancements. First and foremost, it has a much easier way of setting the dial. Instead of relying strictly on teaspoons as the increments of measure, there are tablespoons and oz/per gallon increments included. This makes it much easier to use since product labeling for mixture rates varies from company to company. Regardless of what increments the label of the product you want to apply is using, it will be easy to figure out the setting with this sprayer compared to the previous model. The second difference is that this sprayer has a holding tank twice the size. 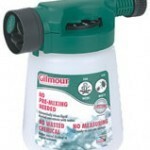 It's a full quart which means you can avoid having to fill it up repeatedly which could be an issue for any large job. Lastly, it has an adjustable nozzle which enables you to set the spray pattern. There are four settings. One directs the spray up, another down, another is a pin stream straight and the fourth is a dousing type that's ideal for low pressure needs when you want to saturate a plant or specific area. It has a maximum setting of 8 oz per gallon.